If Donald Trump or any Republican who might manage to win the White House and tries to dump the Affordable Care Act aka ObamaCare… it’s looking more and more like that’s not going to be easy to do. 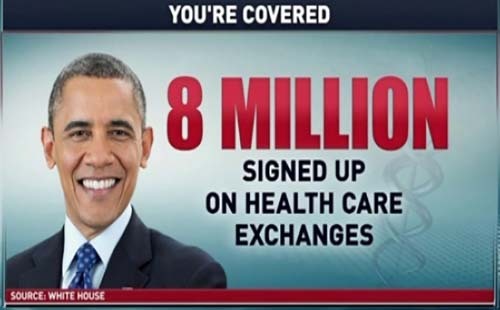 According to reports, almost 8.3 million people have enrolled in ObamaCare plans, putting the administration well ahead of last year’s total at the same point in the sign-up season. Federal health officials announced the latest figures on Tuesday, touting stronger-than-expected demand in December as healthcare customers race to find or switch plans ahead of the deadline to sign up for coverage beginning 2016. The quicker pace likely indicates people are seeking to avoid the higher cost of being uninsured in 2016. People without insurance by tax season will face far steeper penalties, almost double the fee from the previous year, reports The Hill. Of the 8.3 million sign-ups, about 2.4 million are new to the marketplace — a figure that is one-third higher than last year’s new total at the same distance from the deadline. Significantly, this year’s sign-ups include 2.1 million people under age 35 — nearly double the number of young people enrolled during the same period last year. “We’re excited in terms of what it means for health security and financial security. We’re excited about the fact that it does mean a younger risk pool, which is generally stronger,” Health and Human Services (HHS) Secretary Sylvia Mathews Burwell announced on a conference call with supporters Tuesday. The growing diversity of the marketplace will be welcome news to health insurance companies, many of which remain worried that customers are older, and therefore costlier to cover, than they had originally expected.